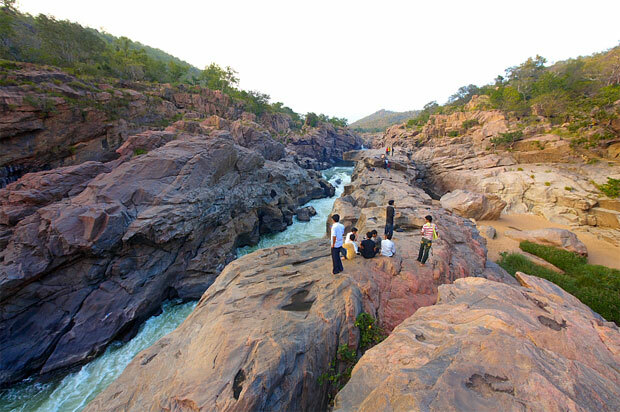 Mekedatu is a gorgeous rocky place with water falls from river Cauvery. The confluence of rivers Arkavathi and Cauvery can be seen here. This place is located near kanakapura and comes under rural district of Bangalore. Cauveri river from Shimsa (Shivana Samudram at Gagana chukki and Bhara chukki falls) flows further to meet Arkavathi which comes from Ramanagaram side in this sangam place. Meke means Goat and datu means jump. The river flows within the distance which can be jumped by a goat. Hence the name Mekedatu for this place. Mekedatu is at a distance of 4Kms from Sangam. One has to cross the river at Sangam to reach a place where two old buses take them to Mekedatu. One has to pay an entry fee of INR 20 and INR 40 for bus (each person). Make sure that you reach before 5.00pm as the last trip ends at this time. The trip begins at 10.00am in the morning. The buses are very old and without any maintenance. Not possible to bring those out of the place and do servicing. There is a view point nearer to Mekedatu from where visitors can see the entire rocky area. The river water flows inside the rocks at some places and goes deep later. Do not try to go down nearer to river point as it is too dangerous and one may lose his life. The water current is very powerful and comes with lot of force. The rock formation is just like an art due to the water flow. The rocks are very slippery and be careful while walking on these. Many visitors bring lunch and snacks to have at this point. We have seen some people having liquor also here which is not permitted. Take proper precautions about kids as they won't notice the steep rocky path while walking. The area is totally surrounded by thick forest. This forest is well known for beautiful birds. Normally 45minutes to 1 hour time is available to be here and enjoy nature. People travelling from Bangalore side have to reach kanakapura either directly or via Ramanagaram. Take left side deviation at Kanakapura (ask any local person for direction to avoid confusion). Well marked boards are available in the entire route until one reaches Mekedatu. Mekedatu is 35Kms from Kanakapura and the road is good. Tourists who come from Ramanagaram and Mysore can come to Sathanur instead of Kanakapura. Take right turn and immediately left. Proper boards are available. The advantage of this route is, one can visit Gali Bore fishing camp. From Sathanur Mekedatu is 23Kms and Gali bore fishing camp is 36Kms. Best season to visit this place is from November to February or whenever water is less at Sangam. If water is more, it may become difficult to cross the river safely. No food is available but for snacks and packaged drinking water. Better bring the food along with you or have it in Kanakapura. Only bus transportation is available either through Sathanur (from Ramanagaram side) or via Halagur (either from Ramanagaram or Mysore-Malavalli). Better to have a private vehicle which gives flexible to see places around and enjoy. Other places to see in this area are Muthathi and Bheemeshwari which are close to Sathanur.